Business Mathematics, Statistics, Operation Research, Research Methodology, Life Insurance Management, Data Science, Time Series Analysis and Index Numbers. 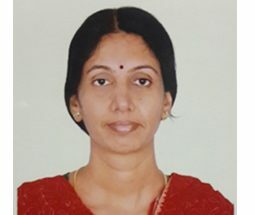 Mrs.Santha Ganesh Iyer has a B.Sc. in Computer Science and is a God Medalist in M.Sc. Statistics from Sardar Patel University. She is also a recipient of Vice Chancellor’s award in M.Ed. She has worked in Life Insurance Corporation of India, Gujarat for nine years in various departments. She has also worked on special projects like Salary Saving Scheme Error Project and Y2K project during her stay in LIC. She has also trained LIC agents as a part of IRDA training program. She also has an experience of developing COBOL programs and UNIX shell scripts while working in IT department of LIC. She has seven years of teaching experience which includes teaching in schools, Pre-university colleges and degree colleges. She has presented a research paper titled “Business management education and Research- Trends and Challenges” in a national conference. She has completed a few online courses like Fundamentals of Economics, Six Sigma, Project Management, R Programming etc. Currently she is doing an online course on Data Science.